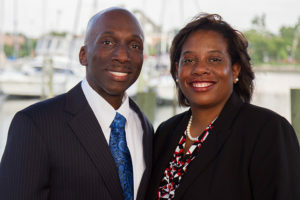 Good Steward Business and Benefits Consulting, LLC was founded in September of 2015 by husband and wife team, Howard and Tamishia Henry. Tamishia has been working in the human services field for over 16 years. She has a knack for seeing the big picture and developing better ways to deliver services to those in need. A natural visionary, she leverages her strategic-thinking abilities to help companies see dramatic growth. Over the years, she also noticed some gaps in the current system of meeting the needs of individuals with disabilities. She had numerous ideas on how to fill those gaps, and her methods were proven to be successful. Howard comes from a completely different background that includes years of experience working for publicly traded companies within the financial services and government contracting sectors. His experience includes a wide variety of specialties ranging in everything from process improvement to quality assurance, among other things. He has effectively utilized these skills to help executives in organizations both large and small become more efficient in their operations while maintaining strict compliance with applicable laws and regulations. When you combine Tamishia’s fun, creative, and compassionate viewpoint with Howard’s business savvy and sensible approach, you get a powerful combination. Their combined skill set provided the foundation for a new company that would be able to more effectively meet the needs of individuals and organizations who serve persons with disabilities. In late 2015, Howard and Tamishia started to seriously entertain the idea of joining forces in a new business venture. Howard was used to Tamishia coming up with unique and out of the box ideas and this one was no exception. They chose the name “Good Steward” because it embodied their core beliefs based on Biblical truths. They operate their business with integrity and believe in being trustworthy and reliable in every aspect of their business and services. They work with each client to define intentional steps toward meeting objectives and present solutions that make sense. Howard and Tamishia have been married for over 16 years and reside in Hampton, Virginia with their lively daughter, Jayla.